With his theatrical booking partner Marc Klaw, Abraham Lincoln Erlanger had an uneasy relationship with the new medium of motion pictures throughout a career that was dominated by a ruthless commercial instinct. The two men purchased a small New York booking agency in 1886, becoming formal partners in 1888. In August 1896 they joined the Theatrical Syndicate which rationalized the booking of shows to minimize travel expenses and layoff days whilst maximising performances and income. Under Erlanger's obsessive and autocratic control, this centralized system became the most powerful commercial monopoly in the American theatrical world. At this time Klaw & Erlanger on their own behalf contracted with Charles Smith Hurd to produce a film of the Horitz Passion Play, and their elaborate ninety minute production (filmed by Charles Webster and the International Film Company) which included lantern slides, hymns sung by a chorus and a tightly scripted spoken commentary, opened at the Philadelphia Academy of Music on 22 November 1897 and toured their theatrical circuit for several years as a special presentation. In 1907 Klaw & Erlanger joined a successful lawsuit against the Kalem film company over its unauthorized film of one of the company's most enduring and commecially successful plays, an adaptation of Lew Wallace's novel Ben Hur, which set an important legal precedent on film copyrights. By November 1909, as motion pictures continued to erode the income from their vaudeville bookings, Klaw and Erlanger forbade their contracted actors from appearing in films. Four years later, in June 1913, however, they had contracted with the Biograph Company to produce two feature productions per week from the theatrical properties they owned; D.W. Griffith was to supervise the productions for Biograph, which continued to deny Griffith's own aspirations to make longer pictures and he left Biograph in October. By the 1920s Erlanger, no longer in partnership with Klaw, continued to book productions, and finally made an arrangement with Metro Pictures for a film version of his personally-owned theatrical property Ben Hur, which repeated its spectacular theatrical career on the movie screen in 1926. 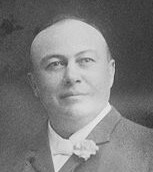 Erlanger remained a financial power in the theatre, and was preparing elaborate plans to expand his activities when he died, on 7 March 1930.